The blog looks updated but I feel I am so detached from it lately. Is that what they call "losing the blogging mojo"? I'm not sure but I think I need to let it all out. Well, it looks updated because of my press releases and current giveaways. I have it on my drafts folder and just schedule it apart from the same breed so it won't crowd. It's what I do, especially if it's a press release that doesn't require much of my time and creative juice. You only need to copy the text, reformat according to your OC-ness and publish it on your chosen date and time. I do the copy-text style for PRs, not because I'm lazy to share my own point of view but sometimes, the PR is lengthy enough that I might bore my readers if I'd add my own slew of words. In fact, my journalistic blood rushing through my veins sometimes abhor the sight of my home page full of press releases. There's nothing wrong about that, IMHO. Other bloggers have their own take about this though (read some here). It's one way of helping the brands (and agencies!) spread whatever news they want the netizens to know. BUT. It could sometimes hurt any blog's content. I, for one, could not publish just any PR. I am a mommy blogger. The PRs that I have published and will publish are those I think I would personally use/support. So what's my point? When all I do are giveaways (not that I'm complaining) and press releases, it somehow loses what I am capable of. My readers (you, lavishly wasting your time reading this) loved me for all my story-telling about motherhood and anything. I am not the type of blogger who gives numerous tips on how to make our children the next ruler of this country or says that using this particular brand could make you the perfect parent, but you have given me a small part of your life by getting a dose of my isms --- and that I am very thankful for. Hence, I don't want to always publish PRs left and right. ONE. Address me as Ms. Denise Rayala. I have a name so please be nice and not call me Mommy Blogger or Ms. Bebengisms or Hi. Call me Queen and I'd publish that press release of a novel in a nanosecond. Chos. TWO. Kindly wait for your material to be published. Follow up once. I understand how you wanted to get as many bloggers as you can to blog about your brand but I also have a life outside this cyber palace. I collect my own "articles" to share to my readers, that's why I do my best to live my life. I'm sure you understand that. THREE. Use the BCC function when sending it to my email so I won't see all the other bloggers you have also emailed. I bet they think the same way as I do. We're good, okay? I made this blog as PR-friendly as I could because I believe that brands and bloggers are the new Phineas and Ferb. However, like event invites, I choose what I publish. Okay, that's it. I got something really important to do. Should I pop this giant zit or wash the dishes? Oh, I might update my Facebook fan page first after this. Hihi. 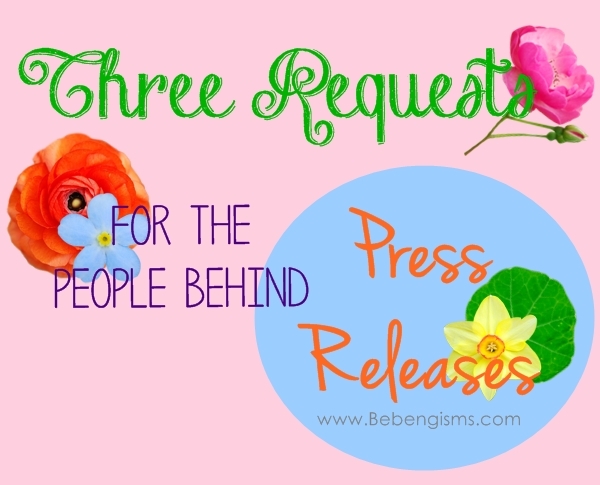 Now, as my reader, what's your honest opinion about seeing press releases on my blog? anywoot, do know that even if i don't leave a comment here from time to time, Bebengisms has been part of my daily "vitamins". Lalo na when I was so sad that I needed something to read and divert my attention to. Nabaon ko na sa limot si LPS, pasensya naman. Still mourning over my lola's death. I realized that, too when I see "celebrity bloggers" write the PRs in their own personal way pa din. Hindi nakaka-bore basahin, unlike what I did. Hey, don't bother about the Little Ponies... Saka na, when you're okay na. Medyo nagulat lang ako sa item #1 sa list, some companies really address you that way lang? Kakaloka. :-) As far as I know, pag official correspondence, whether in print o sent via email, dapat i-address by name basta naman alam ng sender yung pangalan. It's like the means of the sender to 'greet' the recipient with respect. Hi, Ms. Denise! I discovered your blog through Ms. Martine's. You just left a comment on the blog about Ms. Frances hehe. I relate to this post ha. I'm still a relatively unknown blogger, but I do receive emails from PR agencies. While the bigger ones (like those that handle Jollibee and Wyeth) address me using my name, yung small brands pa talaga yung gumagamit ng "Hi Mommy Blogger." Kaya dedma ko na yung email. Sometimes talaga PR agencies should have workshops din, no? Ano lang ba yung 15 minutes to type the individual bloggers' names?